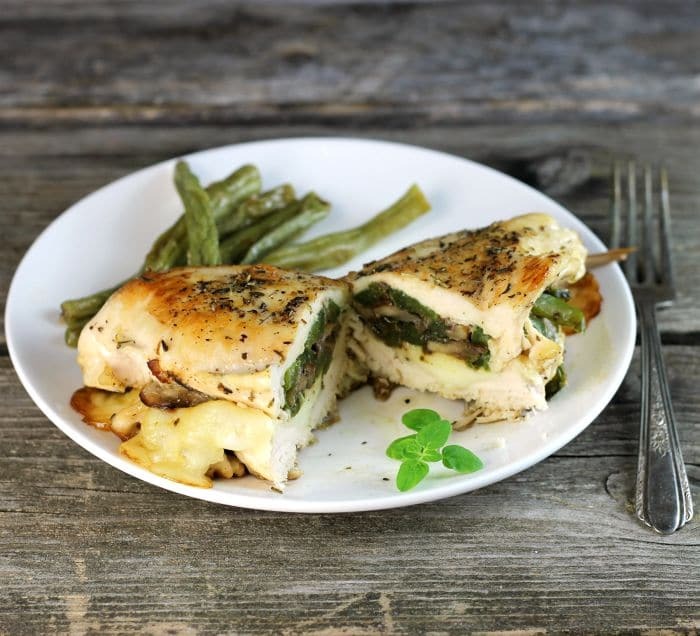 Italian stuffed chicken breast is made with a few ingredients but is full of flavor and is a perfect meal for during your busy work week. 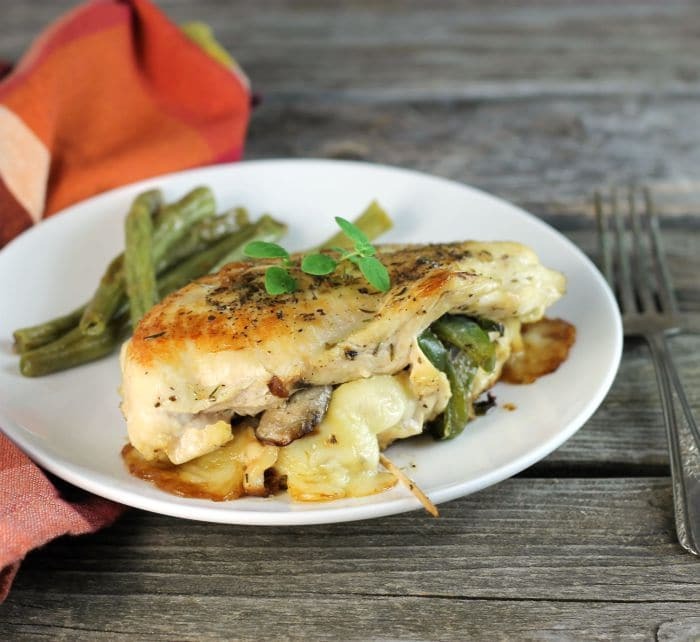 Italian stuffed chicken breast is stuffed with mushrooms, green peppers, onions, garlic, and provolone cheese then seasoned with Italian seasoning. The chicken breast is tender, juicy, and full of flavor. I have made these chicken breast three times in the last couple of weeks. The first time I seasoned them with Italian seasoning that I had purchased at the store. The second time I really wanted to see how they would be if I used my herbs that I have growing in the garden. The third time I made them I made them with the store bought Italian seasoning again. I know normally the fresh herbs would be the way that I would go, but to tell the truth, I like the Italian seasoning. Maybe it was the convenience, but also the flavor. I like the blend of herbs that are in this seasoning. When I used herbs from the garden I used basil, oregano, and parsley. But really, either way, this chicken is tasty. So here is what I did to make this recipe. I sauteed the mushroom, onions, green peppers, and garlic until they were soft. Butterfly cut the chicken so it easy to stuff. Season the inside with Italian seasoning, salt, and pepper. Once the chicken is cut and the veggies are sauteed, divide the veggies evenly between the 2 chicken breast. Top with a couple of slice of provolone cheese. Bring one side of the chicken over top of the cheese and veggies. Secure the cut side of the chicken with toothpicks. Season the outside of the chicken as you did the inside. Brown the chicken on both sides. Place in a preheated oven for about 15 minutes or until the cheese is melted and the chicken is totally done. There you have it the steps to Italian stuffed chicken breast. In a cast iron fry pan heat about 3 tablespoons of olive oil. Add the green peppers, onions, mushrooms, garlic and saute until veggies are tender about 10 to 15 minutes. While the vegetables are sauteing prepare the chicken by cutting them butterfly style. Open up the chicken breast and season with salt, pepper, and Italian seasoning. Divide the vegetables between the two chicken breast and top with two slices of provolone cheese. Bring the top part of the chicken breast over the top of the vegetables. Secure the cut side with toothpicks. Season the top of the chicken with salt, pepper, and Italian seasoning. Place the chicken into the cast iron skillet season side down. Season the top of the chicken as you did the bottom side. Brown both sides of the chicken about 1 1/2 per side. Place the cast iron skillet in the oven and bake the chicken for about 15 minutes until the cheese is melted and the chicken is no longer pink. 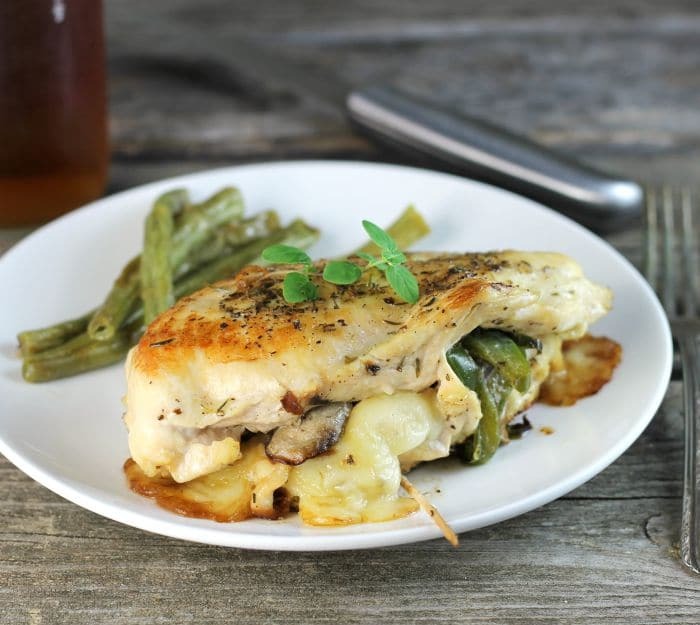 This chicken looks delicious – love all the vegetables and cheese stuffed in! Yum. Mushrooms AND cheese? I’m so in! You’re speaking my language here, Dawn! This looks wonderful. Have great week! 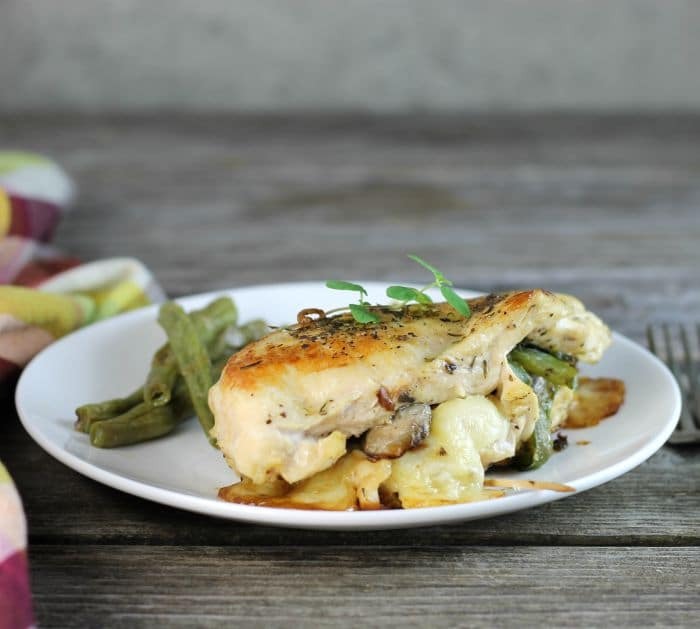 This stuffed chicken breast makes a wonderful dinner! Love that veggie stuffing. Wow, lotta flavor in this dish! I’d be delighted to have this show up on my plate — such an appealing and tasty dish. Thanks! This sounds great! I love all of the flavors in this! I haven’t made stuffed chicken much but I would love to try this recipe!! How absolutely delicious Dawn! Love everything about it! A great way to perk up chicken. I use a lot of dried Italian herbs too – love them.